I hit a bit of mental weakness during the middle ones, but it also started pouring down rain during the middle five. It was a tough workout tonight, tougher than my first workout last Thursday. Barry was worn out from work and mowing the yard, so I was on my own for this one. I learned that it’s definitely easier to push yourself when you have someone else with you. I also went out a bit too fast on the first one. I’m not sure how much that affected me the rest of the workout. When I finished my cool down I was freezing. It was no longer raining, but I was soaked from the rain and the sun was setting so it was getting pretty cool out. The long sleeve I wore to the track got soaked during the rain, so I didn’t have that to put on. My hot shower when I got home never felt so good. Dinner was a delicious grilled chicken salad. I’m not very good at photographing food. 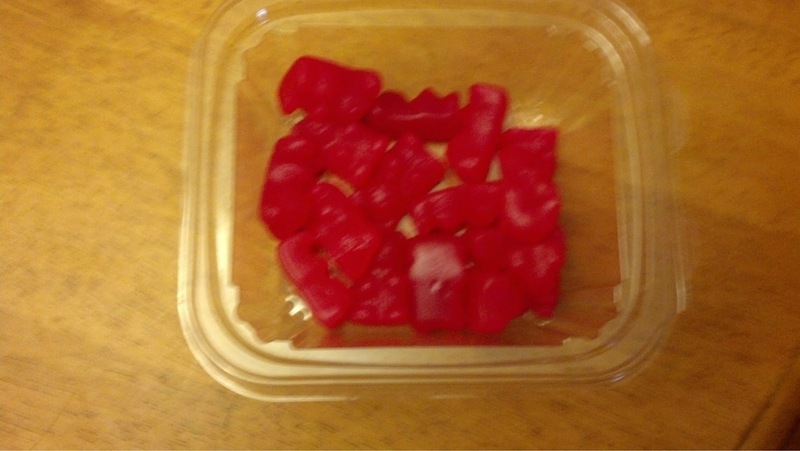 I love cinnamon bears!! Lab studies have shown that cinnamon may reduce inflammation. That means I should eat cinnamon bears after every track workout, right? 1. After your last repeat, do you do your recovery jog in addition to your cool down? I’m wondering if it’s normal to include the last recovery jog as well as the cool down, or if most people go straight into the cool down. I figure it’s mostly a matter of preference, but I’m just curious what others do. I have been doing my recover jog and my cool down (so 3 laps easy after the final interval) and so far I think I like it this way, especially since I’m only doing an 800m cool down. 2. When you do a track workout and a tempo run during the same week, how do you space them out? I typically run Tuesday – Thursday during the week, so I’m planning to do a track workout on Tuesdays, a normal paced/recovery run on Wednesday, and then a tempo run on Thursdays. Does that sound like a good plan? 3. When you do a track workout do you do them alone or with a running buddy/group? Which do you prefer? I liked having Barry with me better than doing it on my own. What is you favorite type of salad? Does it change based on the season? Anyone else love cinnamon bears? Do you say “pouring down” rain, “pouring” rain, or something else? I usually say pouring down rain, but sometimes I get made fun of for that. People say “as opposed to pouring up?”. Other times I’ll say “it poured the rain”. Such Good Questions! Sounds like we are doing similar things these days (although I did speed yesterday and a tempo today-whoops) because I will be travelling this week and not sure if I can get a good tempo run in and my legs felt great. I do one or two final laps around the track before making the .75 mile jog home. I do it alone, but I think group runs with fast people can be effective. Glad your legs felt great on your tempo! 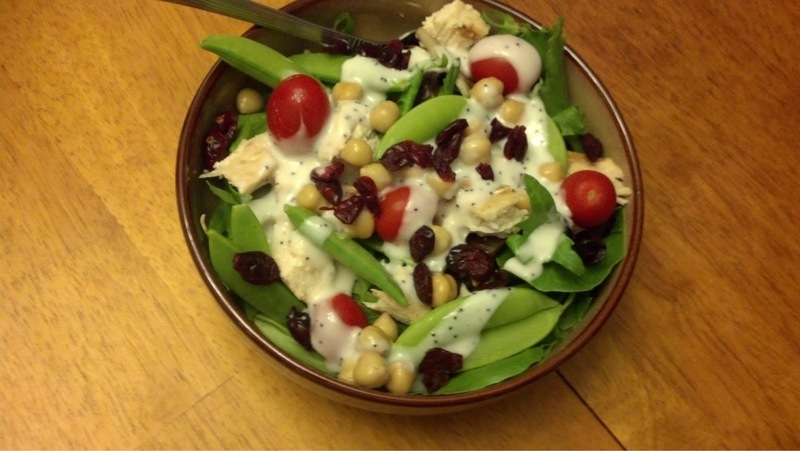 Nothing better than a chef’s salad and it is raining cats and dogs! I do love a good chef salad, like the one from Verona’s. 1. I always had my runners do the last recovery lap before their cool down. We would go straight from the repeat to a walk of about 100 meters, to an easy jog for the remaining 300 meters. Once back to the starting point, we’d do our cool down run. Mainly we did it this way since that was how I’d figured out their total miles for that day. So to answer your question, it’s a matter of preference. 3. Occasionally I had to do track workouts alone and hated it. Usually I had about 12-16 runners show up. Having other runners to challenge you, makes you a stronger runner. I would love to do a track workout with 12-16 runners! 1. Depends on how far the track is from home. In Rochester, the track was already 1.3 miles from my apartment, so after my last repeat, I’d just head right home. But if I were driving, or lived much closer, I’d probably do the last one, then cool down. But basically, as long as you get in about a mile after your last hard effort, no biggie. 2. Perfection. Unless you find you aren’t quite recovered on Thursdays, AND you are planning your long run for Sunday, then you could try T/F/Sunday, to see if that feels better. But as long as you’re feeling able to complete your workouts, go for it. 1. Anything topped with lemon juice and feta cheese. 2. No. Sour gummies? Now we’re talking! 3. Pouring rain, which is rather appropriate, as a big ‘ole storm seems to be moving in at this very moment! Haha hope I didn’t overwhelm you. Thank you for answering my track questions! I love sour gummies. Sour Patch kids are one of my favorites. That’s a tough workout! 400’s are so tough. Those are some great times, especially without a full break between!! I try to give myself 2-3 non-speedy days after a track workout because they hurt my legs. It was definitely tough, both mentally and physically! What would constitute a full break in between intervals? Well, I’m a little late to the game and I’m sure you’ve figured out what to do by now…but…I do add my recovery interval on top of my cool down…so I would do 400 after my last interval plus the 800 cool down. I usually put at least one easy day in between my tempo and interval workouts. With the Hansons program, you did intervals on tuesday, no run on wednesday and tempo on thursday. Whenever I try to do sit-ups or anything on the ground, the dogs just walk all over me, ha. They think it’s play time. A little extra lick at the top probably helped, ha! Haha Hank is like that. I have to keep him out of the room while I XT because he gets in my face.